Say hello to your future Power Rangers, they’re bloody weird. Although the Power Rangers and Super Sentai franchises have been forever linked since Power Rangers began 24 years ago, the Western side of things has never had creative input on the making of the Japanese show—it has simply been left to create its own series out of Super Sentai footage. That’s changing this year. Ever since Saban first made a deal with Toei to use the action footage from Kyoryu Sentai Zyuranger to create its Mighty Morphin’ Power Rangers show, Sentai and Power Rangers have had a weird, unspoken relationship. Toei would do its thing, churning out series after series every year, and Saban would pick and choose which shows to bring over and transform into new seasons of Power Rangers. Each side would go about its business with little to no exchange or acknowledgement between the two. More often than not Power Rangers would dramatically alter the context of the original Sentai footage it used, and shoot new scenes to further extrapolate itself from the series it was based on. The closest there’s been to a Power Rangers influence on Super Sentai was when Saban commissioned Toei to film an extra half-season’s worth of new action scenes with the Zyuranger costumes to extend Mighty Morphin’ Power Rangers. 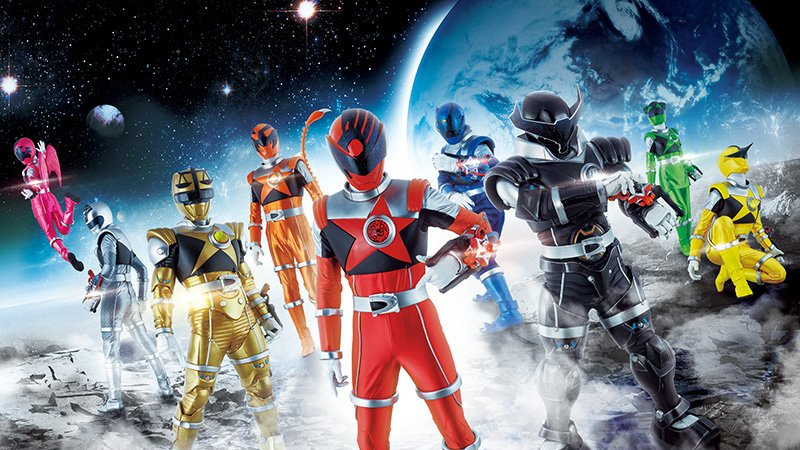 The times are changing though, and for the first time ever the minds behind the Power Rangers brand in the West have had a creative input on the next Super Sentai show, Uchuu Sentai Kyuranger, which is set to debut in Japan next month. We got brought in pretty early on and got to hear what the creative pitch for the show was, which was a space zodiac cosmos type of thing which we get excited about. [Bandai America] got to help at the conceptual stage to think about what could the zords be, what could the weaponry be, what would be the Ranger Key or Dino Charger? Think about Captain America. He used to wear red white and blue spandex. His costume became more cool and tactical looking. He aged up the look of a classic hero. We were constantly bring up examples like that never to undermine what makes Power Rangers Power Rangers but to say, let us help to form the shape of Power Rangers as respectively as possible to make it competitive as possible in the US. Even if the input is relatively minor, it marks a significant change in the decades-long relationship between Super Sentai and Power Rangers—at the very least, it implies that after Saban is done with Power Rangers Ninja Steel, it’ll jump straight to turning Kyuranger into the next Power Rangers show. Going forward though, it seems like Power Rangers and its Japanese counterpart will be closer entwined than ever before.